Jiu Jitsu is a form of martial arts that was developed in Brazil. The word translates into “gentle science” and was taught as a form of defense that smaller people could use against a larger opponent. Derived from a Japanese form of Judo, the sport has taken on new meaning in the modern day and age. With Mixed Martial Arts becoming a phenomenon, so too has popularity of Jiu Jitsu, also called Brazilian Jiu Jitsu, risen along with it. If you are interested in taking class, already studying for the next belt, or competing at the tournament level, there are loads of resources for you on the internet. To prove it, we have gathered the top 50 Jiu Jitsu blogs below. These bloggers often teach Jiu Jitsu in addition to practicing it. Rafael’s path began by studying Bruce Lee’s Jeet Kune Do Concepts, Escrima, boxing, and Thai Boxing under his father and Richard Bustillo. In August of 2004, shortly after turning 21, Rafael became the youngest American to receive a black belt in BJJ at that time. His blog is full of thoughts, tips, and items on daily life. The Brotherhood refers to all who practice Jiu Jitsu, no matter what their reasons are. Nicolas Gregoriades is currently head instructor for Jiu-Jitsu at the Budokwai in London. Popular posts include the Animal Drill Workout and nutrition post-workout. Renato Magno has been involved with Jiu-Jitsu for nearly 30 years. During this time, he has earned numerous distinctions during his career such as Pan-American gold medalist. Check out his blog for the latest in tournament performances and even instructionals. She is teaching the first women only BJJ class in Northern Virginia. Her goal is to show all women what the sport can do for them. A shoulder injury was recently discussed. Lori holds a 4th degree black belt in Can-ryu Jiu-jitsu. She also runs her own dojo and uses the blog as a way to record her training and teaching experiences. One of the most recent included five ways to improve your own martial arts. Seymour Yang lives and works in London. For over ten years he trained and ran his own club in Japanese-style traditional Jiu Jitsu. He now trains in the sport and has interviews, reviews, and more on his blog. This blogger can go a while between posts, but is still worth a look. Scroll down to get instructional videos and techniques. Answers to reader’s questions are also tackled. Although the blogger keeps secretive about themselves, they do share loads of tips for learning Jiu Jitsu. Choose from beginning Jiu Jitsu, theories, videos, and even tutorials. One of the most recent posts was on Open Mat. These bloggers collaborate to write more about the art of Jiu Jitsu. This blog is part of Roseberry’s Martial Arts Center in Lincoln, Nebraska. They are dedicated to the serious study of Jiu-Jitsu but also throw a little humor in. The blog features a video selection, gallery, articles, and even entries specifically on techniques. The blog is full of posts on everything from the sport for kids and adults. You can also get the latest team updates. Be sure not to miss the main site with more. This program was established in 2004. Located in Kent, they have the latest updates on classes on the blog. You can also get entries on grappling, competition, and videos. See how you can learn Jiu Jitsu together with the help of this blog. Tom, Jennifer, and two kids have been training together since 2008. They recently had a wedding anniversary and share more. Visit here for the official site of the USJJF. Topics include what’s new, national programs, resources, and much more. Members also post loads of useful photos and videos. Learn more about the practice of Jiu Jitsu from those practicing it in these blogs. Sam is currently a purple belt in BJJ and a level five under Gokor Chivichyan and Gene Lebell in Paragon, Hollywood. His blog stands out for offering everything from techniques that work, those that don’t, and related thoughts. Steve Zacher has been training Brazilian Jiu Jitsu since November, 2006. After 15 years of too much living, he decided to join his son in martial arts classes, and this blog was the result. The blog also offers reviews, art, tips for health, and more. Get online Jiu Jitsu tutorials from Vinicius Magalhaes here. Technique and curriculum is also included. There is also more about the training center included. The Beginner FAQ is reason enough to visit this blog. The blogger began training in 2006 and shares loads more about it. Essential reads also include training, BJJ for women, and a rolling guide for beginners. Visit here for the blog of a beginning Jiu Jitsu student. Ashley is from Ontario where she is working with a white belt. She is also pursuing a master’s degree and shares more. She is a blue belt in BJJ and a graduate of Brighton University. Rachel also just got back from a year of working and training overseas in Bahrain with Alliance Middle East. Hear about it all on her blog. Get a look at a journey from “a deluded Taekwondo Blackbelt and BJJ Noob.” Kintanon shows his weightlifting goals and other progress. A roadmap to purple belt was recently discussed. Dolph is from Atlanta where he chronicles the journey of a BJJ purple belt. At only 118 pounds, he is determined to complete. Popular posts include why he trains and an annual performance review. John Logan is doing P90X and starting Brazilian Jiu Jitsu. In the past he has done other forms of martial arts. The blog focuses on BJJ in Japan plus ways to keep fit and healthy. The title means special or hidden knowledge. Skinny D is addicted to BJJ and keeps the blog as a record of his training. A recent post was on a particularly useful submission move. Stop here for the blog of “a young-ish man living, working, and training in Brazilian Jiu Jitsu in Philadelphia.” The blog is intended to help set goals and record insights gained along the way. Thoughts on “The Biggest Loser” were recently shared. Proving that Jiu Jitsu isn’t just for men, check out these ladies’ blogs. This blogger isn’t afraid to post goals and quotes that help her reach them. She is a blue belt in Brazilian Jiu-Jitsu under Tim Mannon. Topics on the blog include an FAQ, advice, techniques, and even tips just for women. She features ramblings on her addiction to Brazilian Jiu Jitsu. Occasional diversions include culture, politics, and anything related. A recent fight on UFC was the topic of a post. This blogger is a thrill-seeking, adrenaline loving BJJ enthusiast. A relatively new blog, she chronicles her studies and thoughts. Thoughts on recent classes were discussed in the last post. Elyse Goldberg is a purple belt from Arlington, Virginia. 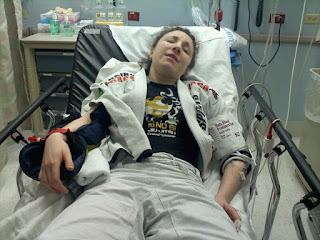 She shares “notes on BJJ and being a gringa at home and abroad.” One of the latest posts was on what happens when Jiu Jitsu goes wrong. 29. You Want me to Put my Head Where? This Jiu Jitsu blog gets listed for its title alone. Stephanie also stands out for bringing humorous posts on the world of “baby steppin’ it through Brazilian Jiu Jitsu.” She recently met: . She is a youth pastor, a substitute teacher and part-time writer. She is also a student of Brazilian Jiu Jitsu, which has become an obsession. A recent blog entry was on her workouts. Her blue belt is “so new it’s crispy.” She is working on BJJ and SST. The blog is also a good choice for applying an engineer’s mind to the physical chess match of Jiu Jitsu. Felicia trains in not only BJJ but submission, kettlebells, and grappling as well. You can even view competition results on the blog. Daily life is also discussed. She is from London where she is an entrepreneur, martial artist, and mentalist. Thoughts related to Jiu Jitsu are often discussed. Some of the latest include referees, reviews, and more. She is a teacher trainer in Seoul, South Korea and a white belt in Jiu Jitsu. Her two big passions in life are not surprisingly: teaching and Brazilian Jiu Jitsu. Read her blog to get a beginner’s journey. Jiu Jitsu and other forms of mixed martial arts are discussed in these blogs. Radhames Familia Jr. doesn’t just study Jiu Jitsu, he often competes in tournaments. Blog entries often discuss them in detail. He also writes about workouts, recommendations, and more. Christian Graugart is from Copenhagen where he is leaving everything behind. He is now traveling around the world to train and compete in various forms of grappling. You can check out his itinerary, get thoughts, and loads more on the BJJ journey here. Get loads of Jiu Jitsu and related posts just for women here. Training, tournaments, and much more are shared. They also interview women in the sport. Stop here for a blog about BJJ, grappling, comedy, videos, Japan, nonsense, and more. The blogger often features Jiu Jitsu related posts along with thoughts. Watch out for some adults only stuff. Regina discusses BJJ, karate, and other random tidbits. Tags range on everything from attitude to women and martial arts. She featured her favorites for the last year in the last post. Valerie quit her job and sold her home in 2006. Ever since she has been training in BJJ and finding herself in Los Angeles. See how and why with a blog read. Megan is a food buff, hospital worker, travel enthusiast, and Christian. She is also making her way in the world of Brazilian Jiu Jitsu at age 30. Check out her blog for daily updates on it all. Sam Y. is a personal trainer who specializes in weight loss, fitness, nutrition, and the martial arts. He also has a special section for Jiu Jitsu, but you don’t have to read just that one. Thoughts on fitness are often shared. Learn how all sorts of fighting combines on this one blog. David is a lifelong martial artist with over 26 years of experience. Labels include everything from BJJ to Wing Chun. Liam initially started his blog to jot down ideas on grappling. However, he now devotes it to those who have a deep passion for Jiu Jitsu and other forms of grappling but cannot devote their entire lives to it. Daily life is also written about. Learn more Jiu Jitsu from these podcasts, audio, and videos. Both radio and video entries are available at this podcast. With 230 episodes and counting, be sure and make time. The most recent is on a newbie in Jiu Jitsu. Stop here to get videos on a variety of forms of Jiu Jitsu. Some of the topics include human chess, tournaments, and thoughts. You can also view by featured, new, or last viewed. This is more of a video blog than anything. A fan of Jiu Jitsu posts loads of related footage on everything from fights to takedowns and beyond. A recent post was on a lost match. This magazine is available in both English and Portuguese for fans of Jiu Jitsu. Check out the videos section for tips on everything from chokes to escaping. The main site also has loads more. OTM has loads of resources for every kind of fighter, including Jiu Jitsu. Check out the podcasts or videos with more. They also offer a blog, diet, fight shop, and much more. What do Jiu Jitsu and Judo have in common? Find out by checking out the podcast. One of the most recent episodes was on the Kindergarten Sensei. Be sure and use caution when reading the above top 50 Jiu Jitsu blogs. Although many have written by those who have and are utilizing the techniques shared, they can also be dangerous to try at home and outside of a dojo. If you need to find a class in your area, try Train Jiu Jitsu which lists over 1,300 schools across the country. Another top choice is The Gracie Academy. Click on Certified Training Centers to find an accredited Jiu Jitsu program in your area.